“The Breath of War,” Aliette de Bodard’s story of society and motherhood in the aftermath of a colonial space war, from BCS #142 Science-Fantasy Month 2 and podcast BCS 121 guest-narrated by Tina Connolly, is a finalist for the Nebula Award for Short Story. Congratulations!! “The Breath of War” is a great story of character-centered, secondary-world (science) fantasy. Aliette’s short fiction has appeared many times in BCS over the years, most recently “The Moon Over Red Trees” in BCS #157 Sixth Anniversary Double-Issue and podcast BCS 136. “Scry” by Anne Ivy, one of the great stories from our first BCS Science-Fantasy Month theme month in 2012, was podcasted at Podcastle late last year. Their listeners really liked it, because they named it a finalist for Best Podcastle Episode of 2013 and voted it the winner! Congratulations! Check out Podcatle’s audio reading of this great character-driven science-fantasy story. 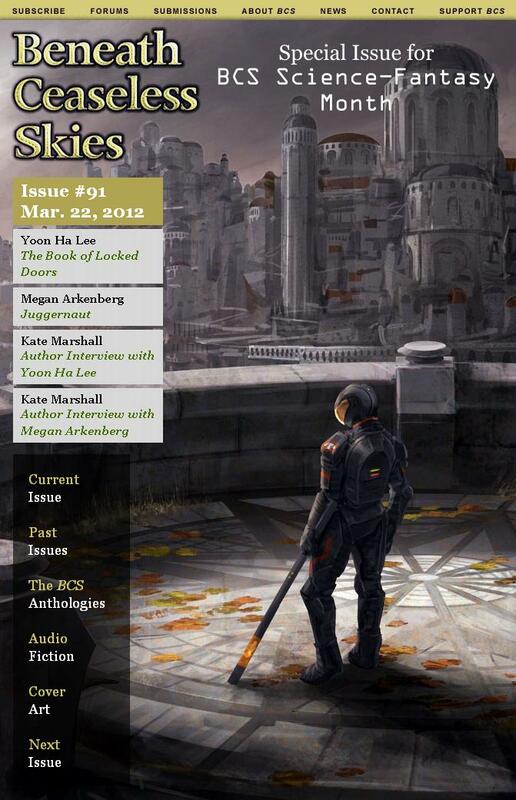 And if you missed the special issues of BCS Science-Fantasy Month 2012, also featuring Yoon Ha Lee, Chris Willrich, and Megan Arkenberg, you can get them together for one low price in an ebook bundle from Weightless Books, delivered directly to your e-reader or smartphone. BCS #143 is out, our second special double-issue for BCS Science-Fantasy Month 2! 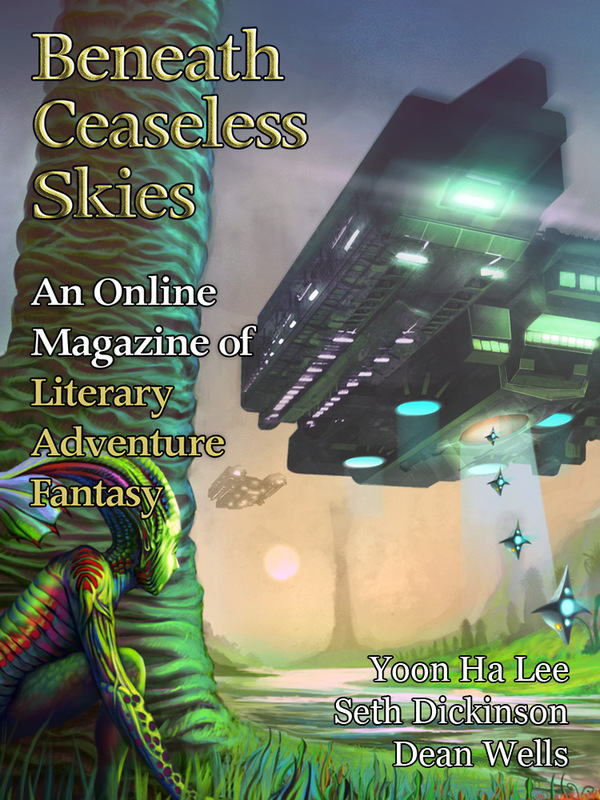 Yoon Ha Lee (“The Pirate Captain’s Daughter” in BCS #27 and many others , including “The Book of Locked Doors” in BCS Science-Fantasy Month 2012) offers “The Bonedrake’s Penance,” a story of motherhood and galactic remembrance. Seth Dickinson returns to BCS with “Sekhmet Hunts the Dying Gnosis: A Computation,” a goddess’s hunt to understand herself and everything that everything is. The bonus story, releasing on the website next Thursday, is the conclusion to returning BCS author Dean Wells’s novella “The Goddess Deception,” set in a future age of the world of his BCS steampunk stories (“Evensong, Having Been Answered;” “To the Gods of Time and Engines, a Gift”). The full issue is available now on ebook at Kindle and Weightless Books. The BCS Audio Fiction Podcast episode is BCS 122: The River Does Not Run by Rachel Sobel from BCS #142, guest-narrated by podcaster, novelist, and BCS author Tina Connolly, who has guest-narrated past BCS podcast episodes including last issue’s science-fantasy podcast story BCS 121: The Breath of War by Aliette de Bodard. A bonus podcast episode, releasing on the website next Thursday, will be BCS 123: Sekhmet Hunts the Dying Gnosis by Seth Dickinson, guest-narrated by Michael J. DeLuca, who has guest-narrated past BCS podcast episodes including BCS 090: Worth of Crows, also by Seth Dickinson. The ‘From the Archives’ story with BCS #143 is Yoon Ha Lee’s “The Book of Locked Doors” from BCS #91, part of our first BCS Science-Fantasy Month in 2012, a tale of sibling relationship and the vanquished underclass after the dust of war has settled. It’s also available in audio podcast: BCS 078: The Book of Locked Doors. 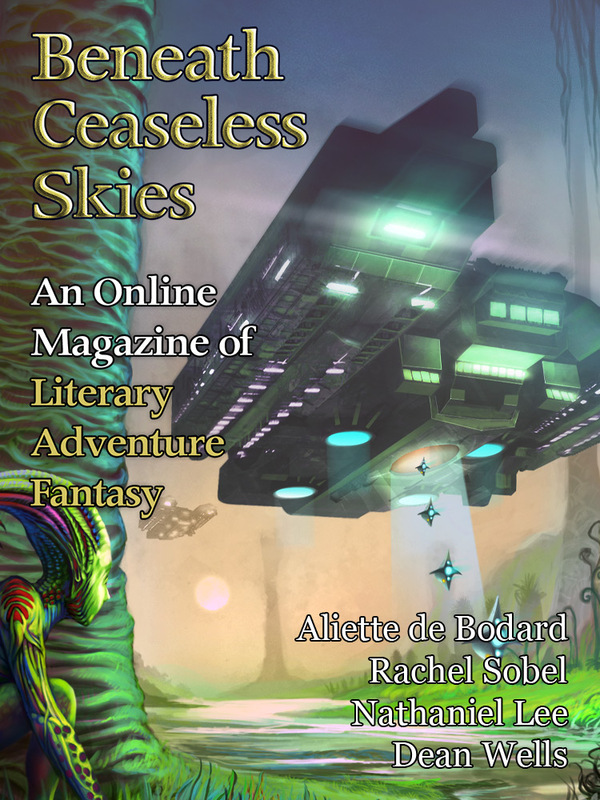 Seth Dickinson has a new story “Sekhmet Hunts the Dying Gnosis: A Computation” forthcoming in BCS #143, one of the special issues for BCS Science-Fantasy Month 2. It will be out on the website next week but available in ebook on Kindle and Weightless Books tomorrow. BCS #142 is out, a special double-issue kicking off BCS Science-Fantasy Month 2! Aliette de Bodard (“Memories in Bronze, Feathers, and Blood” in BCS #45 and podcast BCS 041, and three others) returns to BCS with “The Breath of War,” a new story in the futuristic spacefaring age of her Xuya world. Rachel Sobel offers “The River Does Not Run,” a tale of personal questing through a strange ruined landscape. The two bonus stories, releasing on the website next Thursday, are both by returning BCS authors: “Stonebones” by Nathaniel Lee, a tale of a forthright young science-fantasy Knight setting out on her own, and “The Goddess Deception, Pt. 1” by Dean Wells, the first half of a novella set in a future spacefaring age of the world of his BCS steampunk stories (“Evensong, Having Been Answered;” “To the Gods of Time and Engines, a Gift”). The full issue is available now on ebook at Kindle and Weightless Books. The BCS Audio Fiction Podcast episode is BCS 121: The Breath of War by Aliette de Bodard, guest-narrated by podcaster, novelist, and BCS author Tina Connolly, who has guest-narrated past BCS podcast episodes including BCS 091: Cursed Motives by Marissa Lingen and BCS 084: One Ear Back by Tina herself. 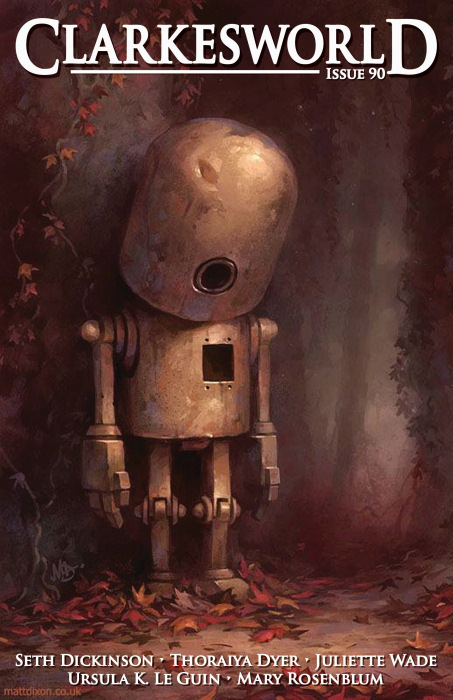 The ‘From the Archives’ story with BCS #142 is “Scry” by Anne Ivy from BCS #90, part of our first BCS Science-Fantasy Month in 2012, a tale of family relationships and the fate and free will of seeing their future. The special science-fantasy cover art is the gorgeous “Sojourn” by Philippine artist Ferdinand Dumago Ladera. We’re also giving away signed hardcover copies of George R.R. Martin and Gardner Dozois’s anthology Old Mars. Learn how you can enter here. BCS Science-Fantasy Month 2 will continue next week, with the website release of the two bonus stories, and in two weeks with BCS #143, featuring Yoon Ha Lee (whose story “The Book of Locked Doors” was in our previous Science-Fantasy Month), Seth Dickinson (“Worth of Crows” in BCS #104, among others), the conclusion of “The Goddess Deception,” a bonus podcast, and more! To celebrate BCS Science-Fantasy Month 2, we’re giving away two signed copies of George R.R. Martin and Gardner Dozois’s hardback anthology Old Mars! Old Mars is an anthology of new F/SF stories about the classic science-fantasy sort of Mars, that had canals and dead alien cities and rayguns and Martians. It includes stories by Howard Waldrop, Matthew Hughes, Michael Moorcock, and BCS author David D. Levine (“Liaisons Galantes: A Scientific Romance” in BCS #108; “Sun Magic, Earth Magic” in BCS #1), whose story about pirate Captain Kidd sailing from Earth to Mars got a Recommended review from Locus online. It’s a gorgeous hardcover, and our copies are signed by Allen Steele, whose story “Martian Blood” leads off the anthology. One of our giveaways will be held next week on the BCS Twitter feed @BCSmagazine the week of Mar. 17; details to come. The other giveaway is right here in this post has ended. To enter the giveaway, comment on this post (here’s a link to the comment box) and say what your favorite science-fantasy work of prose fiction is, and why. It can be a short story or a novel, but it has to be a work of prose fiction (not a movie or game). The winner will be chosen from a random drawing of all entries. This giveaway ends Wed. Mar. 12 has ended. For the Full Rules, click on Show Hidden Text below. You must leave your comment on this Old Mars Giveaway post. Comments left anywhere else will not enter you in the giveaway. You must post your comment before midnight PST on Wed. Mar. 12. Any comments posted after that will not be eligible. 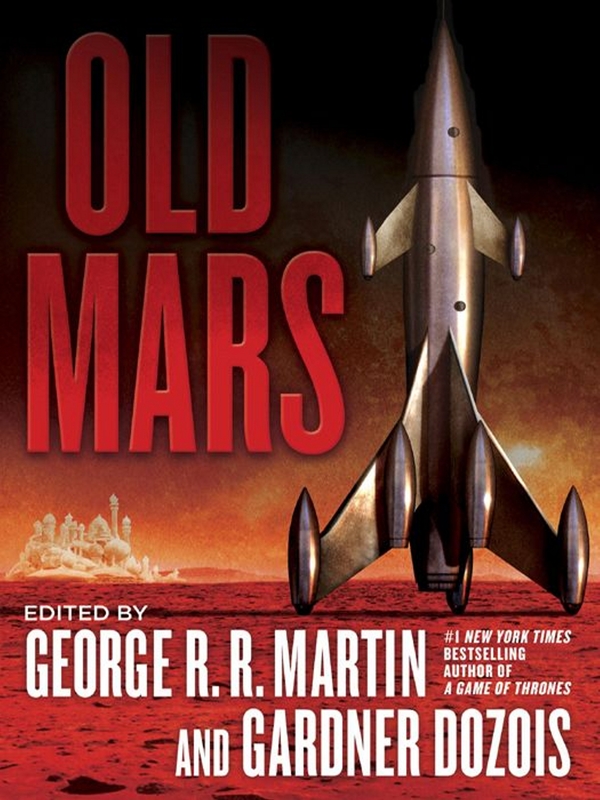 BCS will conduct the random drawing from all eligible entries and mail the signed copy of Old Mars to the winner. Why science-fantasy? Or, why are there spaceships in my BCS this month? We asked that question back in March 2012 when we did our first BCS Science-Fantasy Month. 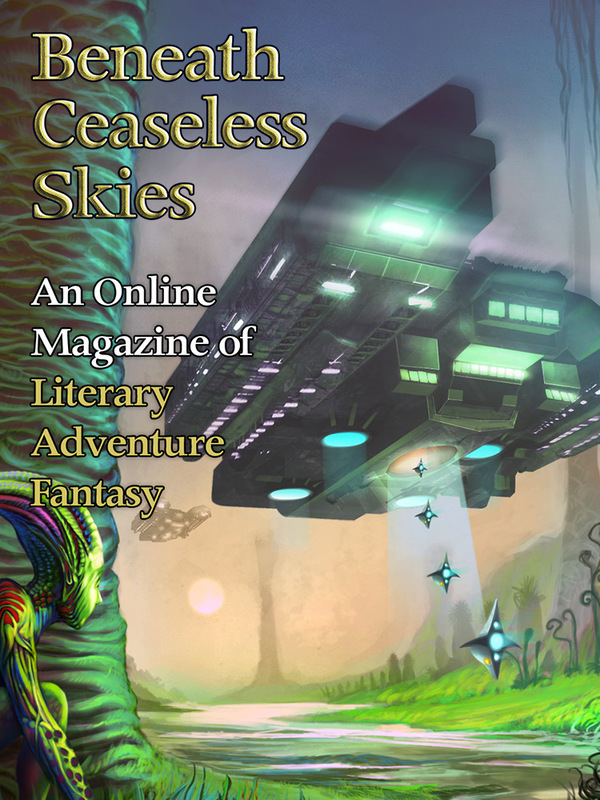 Beneath Ceaseless Skies is character-driven stories set in awe-inspiring worlds. That those worlds be pre-modern is only a personal preference, one that many fantasy readers and our editor share. But as our first BCS Science-Fantasy Month showed, that awe can come equally well from settings that are more advanced than our world, rather than less. Science-fantasy has as rich a tradition as fantasy, from seminal early works like the 1930s space opera of E.E. “Doc” Smith (writing in the same era as Robert E. Howard) to best-selling sagas like Frank Herbert’s Dune (breaking out in the same decade as The Lord of the Rings). So swap your plate mail for pressure suits as BCS takes another month to showcase great literary adventure science-fantasy; stories in secondary-world settings that are futuristic. These special double-issues include returning BCS authors Aliette de Bodard, Yoon Ha Lee, Seth Dickinson, Dean Wells, and more. They feature bonus stories and a bonus podcast episode, along with special science-fantasy cover art and giveaways for signed copies of a George R.R. Martin and Gardner Dozois anthology. The full issue(s) are out early on ebook at Kindle Store and Weightless Books; the bonus stories will be released later on the website. We hope you enjoy BCS Science-Fantasy Month 2! And if you prefer your fantasy worlds not so futuristic, rest assured that literary adventure fantasy will return to BCS next month.